OYSTER BAY TACKLE, Ocean City Maryland, and Fenwick Tackle, Fenwick Island Delaware. Sunday and the wind quit on Monday. Despite it all, we saw some fish. Before the blow we saw a LOT of nice stripers from the Inlet and Surf. Further offshore the first threasher shark was caught. are out of state it IS legal for you to catch clams in Ocean City. that for you at Oyster Bay Tackle or call 1-855-855-3906. 2013 White Marlin Open T's are here! Instore or Online. 2013 Shark T's! In store or on  Online. We also have the  2013 Shark Tank Tops. sharks and rays as well. Caught on FRESH bunker." caught a couple dinks, a few sharks, and too many to count skates." 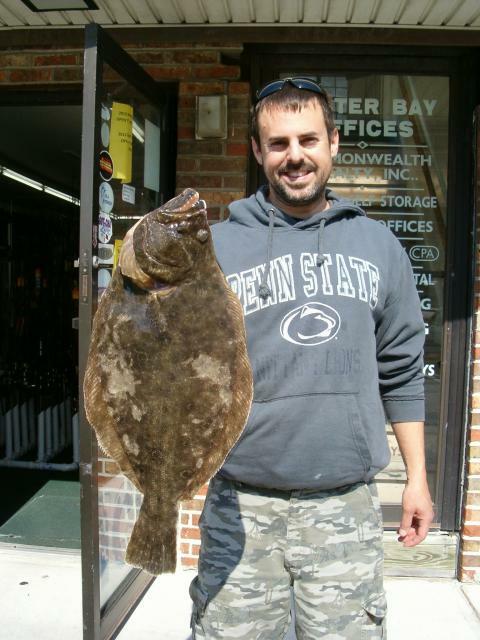 Frank Fetter of Ocean City, MD came into Fenwick Tackle with a 38.5"
himself. We fight those devils for 15 or 20 minutes and land them both. Well that made us really good friends and we had a very good visit." of a big rock this weekend. striper was cought on fresh clam off the surf at Fenwick Island." weighing 21 pounds on the Beaches of Delaware. sand sharks as well that night. All these great pictures are in our  Surf Fishing Photo Gallery. 31.5" caught on Storm Lures at the Indian River Inlet on 5/20/13. His picture is in our  Delaware Photo Gallery. measured 17, 17 & 19-inches. sharks. An occasional striper has been caught." striper caught by Brooks Kline at the South Jetty. Caught on live spot. 5 black drum on clams." bay behind Assateague around the Duck Blinds on 5/21 on live minnows. but kinda skinny… it would have weighed 7 or 8 pounds in the fall! combo of live minnows and fishbite. the low out going tide. the few charters available in North Ocean City. there again. Talk to you soon, Dave" Check out his new web site. had a hot bite on Thursday as well. and a pick-up on tautog catching from the Oceanic Pier. cbassing would be a cinch. had a couple cbass close to 5 pounds & some clients in double digits. tog and even some ling — no fluke yet. degrees on the surface yet had 44 on the bottom..
Time will tell whether the bite improves. force more young fish into the spawning stock. Much more on that below..
been the backbone of this fundraiser, have always been there — always. hundreds; Gus from Accurate Pawn in Baltimore brought three nice St.
many to remember! Thank You All! participants' pain will truly result in fisheries gain. Is already..
artificial reefs, and inner and outer breakwaters in the coming weeks. drum. This weekend traditionally offers the best action with boomers. and an 82.7 pound behemoth taken by Tom Kuzsma on the Pirate King. Foundation. Come to Oyster Bay Tackle or buy online. Bergalls. For me that is the most frustrating part. fish don't move into our area as the water gets warmer. reserve space on a special trip please give us a call at (302) 645-TUNA. effective. We have weighed a couple of nice trout from the Inlet lately. Masseys and the hot spots. Gulp Alive and live minnows are the ticket. some nice stripers caught from the Indian River Inlet and also the surf. Flounder are biting. Kingfish, croaker, and spot at Beach Plum Island. Blues in the inlet and surf. Big drum in the Delaware Bay. caught a couple tog. As they put it ” what a great adventure”! under a dozen sea bass and one tog shy of our limit. bakers dozen sea bass, a couple of them are nice big knot-heads." fish off the beach. Check out his new web site.